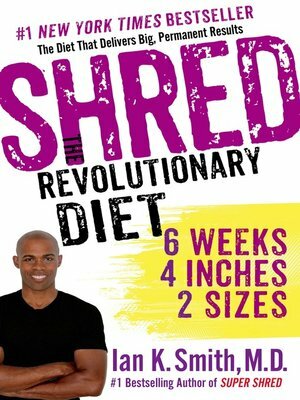 Dr. Ian K. Smith's Shred is the answer to every dieter's biggest dilemmas: how to lose that last twenty pounds? How to push through that frustrating plateau? What to do when nothing else is working? Here, Smith has created a weight loss program that uses all he knows about strategic dieting in one plan—like putting all the best players on the field at once to create a can't lose combination. Shred combines a low GI diet, meal spacing, and meal replacements. Those who follow Shred will constantly be eating (every three and a half hours! ), four meals or meal replacements (soups, smoothies, shakes) and 3 snacks a day, over a six week program. Shred also introduces Dr. Ian's concept of "Diet Confusion". Diet Confusion, like muscle confusion, tricks the body and revs up its performance. In the same way you need to vary your workout to see results, switch up your food intake to boost your metabolism. No matter how often or how unsuccessfully you've dieted before, Shred: The Revolutionary Diet will change your life. Shred has taken the internet by storm, and thousands have already joined Dr. Ian's Shredder Nation, losing an average of four inches, two sizes or twenty pounds in six weeks. Utilizing the detox from Fat Smash Diet, the intense cleanse of Extreme Fat Smash, and varying food of The 4 Day Diet, Shred is a six week plan to a new way of life! More about Ian K. Smith, M.D.